3-on-3 Blazers: Is it All-Star time for McCollum? This week's topics focus on CJ McCollum's All-Star ambitions, Damian Lillard's excellence and what the Blazers can do to improve this season. The Trail Blazers' first game of the regular season, against LeBron James and the Lakers, is two weeks and four preseason games away. 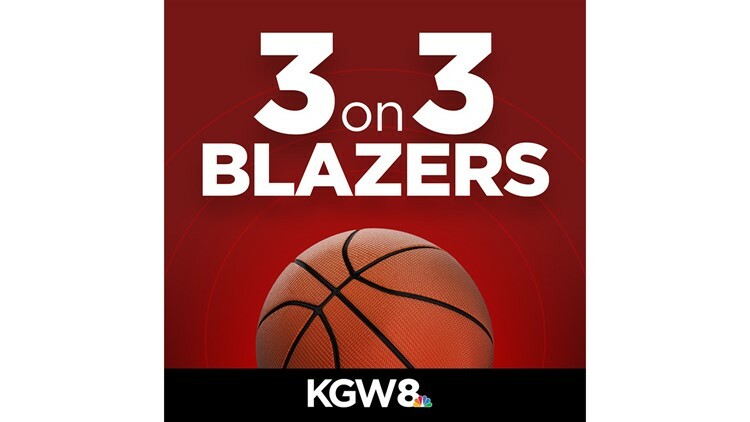 It's time to check in on the Blazers with another edition of the 3-on-3 Blazers podcast. 1. The Athletic’s Michael Scotto asked CJ McCollum in an interview before training camp if he believes this will be the season he’s named an All-Star for the first time. McCollum’s answer: “Absolutely. I don’t think, I know.” That confident response leads us to this two-part question. One, what must McCollum do to be named an All-Star this season? Two, which Blazers player do you think has a better chance at being selected to the next All-Star team: CJ McCollum or Jusuf Nurkic? Orlando: McCollum has thought about this and had a very specific answer on how to reach that goal when he was asked about it at media day. "More assists, less turnovers and be a top 5 team in the West" before the All-Star break. If CJ has a shot at his first All-Star appearance, the Blazers have to win big early. He can score 25 points and dish five assists a game, but if the Blazers aren’t near the top of the West, it’s not going to happen. Jusuf Nurkic has less players to beat out to earn All-Star status at his position, but McCollum is closer. He’s likely leading the popularity contest too. Although, another case of Nurk Fever could change the game. Nate: If McCollum is going to make the All-Star team, he needs to take major strides with his passing and defense. McCollum has been exceptional as a spot-up shooter and a guy who can create his own shot. But when Lillard isn’t on the court, we’ve seen McCollum struggle with turnovers and getting other players involved when he’s the primary ball-handler. His defensive rating last season was 104.7, which was much better than the season before but there’s still plenty of room for growth. We saw Lillard take a step forward defensively last season. Maybe we’ll see the same improvement from McCollum. And despite the guard-heavy Western Conference, McCollum has a much better chance of making the All-Star team than Nurkic. Not even close. Jared: A lot of things would need to go right for McCollum to make the All-Star team. He's been listed as an All-Star candidate on various lists before, so it's not like his name isn't out there for consideration, but there are so many talented guards in the conference and and there are only six guard positions available (at most) in the West. For McCollum to be one of the handful of guards selected among a group that includes Steph Curry, James Harden, Russell Westbrook, Klay Thompson, Jimmy Butler (barring a trade to the East), Damian Lillard, Donovan Mitchell, Chris Paul, Jrue Holiday and Devin Booker, among others, the Blazers have to win. Portland will have to be one of the best teams in the NBA from the start of the season for McCollum to get the recognition necessary to crack that list above. In addition, McCollum would need to improve his efficiency, his playmaking and passing, and his defense. McCollum is a better player than Nurkic, but considering the glut of uber-talented guards in the West, Nurkic has a better shot at making the All-Star team as a center than McCollum does as a guard. 2. We saw Damian Lillard put the Blazers on his back last season, especially during the 13-game winning streak that landed the Blazers the No. 3 seed in the Western Conference. Will he need to be that type of player again or do you see other players relieving some of that pressure this season? Nate: During last year’s 15-1 stretch in February and March, Lillard averaged a Herculean 31.4 points per game while shooting nearly 40 percent from beyond the arc. When he fell off that pace, the Blazers limped to the finish line. I believe Lillard must play close to that level all season if they’re going finish in the upper half of the Western Conference again. There’s not enough playmakers that can create reliable scoring opportunities outside of Lillard. Every preseason, a goal for the Blazers is to have Lillard play off the ball more. But we’ve yet to see it because he is the Blazers’ best ballhandler and the offense is not as efficient or explosive when he’s not the centerpiece of it. The addition of Evan Turner was supposed to help, but the offense has not clicked with him at the point. So, who are the Blazers going to turn to? Improvement from CJ McCollum won’t be enough. They need another perimeter scoring threat. Jared: Damian Lillard will carry the Blazers like he always does. That's what superstars do. He seems to have one or two stretches of elite play every season, where he looks like the best player in the NBA. During those times, I don't think he's deciding he needs to put the team on his back. I think he's just having a hot streak. During last season's 15-1 stretch referenced by Nate above, it's not like Lillard changed that much how he was playing. He didn't boost his usage rate, he didn't start taking a bunch more shots. The biggest difference was he started shooting a little better from the field during that time. When the Blazers were at their best last season, it wasn't because Lillard was carrying the team anymore than he usually does. Lillard is always great. What we really saw during that stretch was the other players on the team step up, especially players like Jusuf Nurkic and Maurice Harkless. Lillard will always be great and do exactly what Portland needs him to do. But if Portland wants to be a great team and not just a good team with a great player, it's not Lillard that needs to step up, it's his teammates. Orlando: The answer is yes, he will need to be that player again. That’s part of what makes him a star in this league. It takes a special skill set to be able to take over games regularly. The roster hasn’t changed and Lillard will have to come through once again. If McCollum can take some of that responsibility consistently, this team has a shot to have similar success during the season and maybe take some of those games they left on the table. 3. What changes would you like to see from the Blazers to make the team more entertaining and/or more successful this season? Jared: When we got together after the season ended in June and talked about what the Blazers needed, most of us said shooting. Though the Blazers' offseason was underwhelming, without the addition of a star or even a veteran player, Portland did get more shooting, especially for its bench. I'd like to see the Blazers focus on shooting more 3-pointers this season. That will require less reliance on the midrange jumper and isolation, and require more ball movement and flow. Last season, the Blazers ranked 11th in the NBA in 3-point accuracy but only 18th in volume. Portland seems to have the personnel this season to improve both of those marks. Damian Lillard, CJ McCollum, Al-Farouq Aminu, Maurice Harkless, Meyers Leonard and newcomers Seth Curry, Nik Stauskas, Anfernee Simons and Gary Trent Jr. all project to be above-average 3-point shooters. I'd like to see the Blazers in the Top 10 in both 3-point accuracy and volume this season. Orlando: I’m guessing this question does not include landing another star to the roster? I like the style of play head coach Terry Stotts runs. The sets are fine, lots of motion, iso, steady dose of pick and roll — it’s all good. I always enjoy a high-tempo offense, so I’m hoping they push the pace. Knocking down the long ball always helps. The addition of players like Seth Curry, Nik Stauskas and Gary Trent Jr. should help with that. Nate: I think I’m dealing with the same thing a lot of Blazers fans are right now: We’ve read this story and we’re pretty sure how it’s going to end. So, some impactful roster moves would certainly pique my interest. But that was an offseason issue and not something the Blazers can address now. What they can address now is the fast break issues they had last year. The Blazers ranked last in the NBA, averaging just over eight points per game in transition. This team has the personnel to get out and run. They just failed to do so. Not only would fast break make the Blazers more fun to watch, but I think the high-quality looks that often come in transition would help resolve the offensive struggles they experienced at times last year.